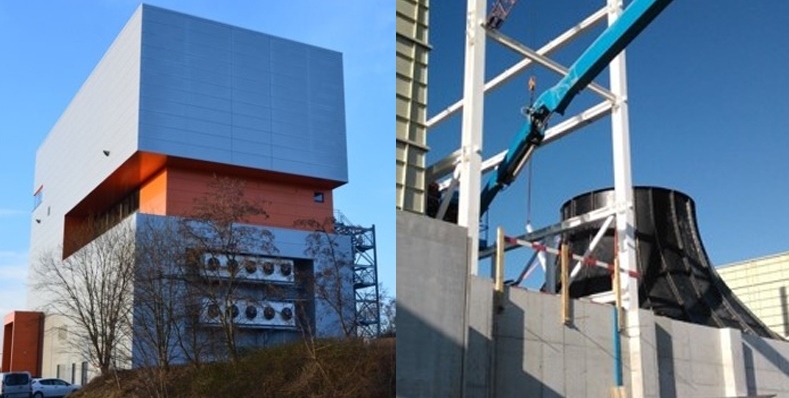 The project includes the construction of a wind tunnel to be used as a free-fall simulator at Grâce-Hollogne, near the airport of Bierset, and was carried out on behalf of the client 2G Projects NV-SA. This is the largest skydiving simulator in the world, with a flying room with a cross-section of 17 feet (5.18 m) inside diameter and a height of more than 10 m.
The wind tunnel has a total height of 30 m and is powered by 2 groups of 3 fans. The technology for the wind tunnel was delivered and built by the Czech company Strojirna Litvinov, who also was responsible for the calculation and building of the steel structure, since this structure supports the wind tunnel and the assembling of the tunnel and the steel structure were carried out simultaneously. Atelier DSH from Liège was responsible for the architectural design of the building. The construction works started in August 2014 and the skydiving simulator was officially inaugurated on 18 December 2015. The assignment of TPF Engineering includes the Project Management, the building services studies related to the building (HVAC, plumbing, electricity and elevator) and the stability study for the concrete parts of the building (carried out by TPF Engineering Liège, formerly Louis Engineering).